[Silver] lets the details of her storytelling subtly suggest its larger implications. In The God of War, seemingly insignificant moments, carefully observed, are used to scavenge value and insight from the neglected and the obscure. Beautifully written, with every character rounded and real, The God of War is a sad, touching, lovely novel. Stunning…. Finely wrought characters and an illuminating portrait of the secret world of autism makes for a powerful, often tragic tale. Marisa Silver is the author for whom we’ve all been waiting. With unabashed voice she steadily, bravely, unerringly tells a heartbreakingly beautiful story for our time. The God of War is the truest novel I’ve read in ages. The characters are painted with compassion and unflinching honesty, and the climax is pithy and consequential… An elegantly observed coming-of-age story. The God of War is such a stunning dive into a desert landscape few have understood and loved as deeply as Marisa Silver. It is no man’s land, and every man’s land — there, her people wage epic battles for their lives, for their loyalties, and for their very fierce versions of love. [The God of War is] a heartbreaking story in the coming-of-age tradition, and at the end, fast-forwards in time to reveal the shards of a broken family and reaches for redemption: By describing his pain, Ares triumphs over his own metaphorical autism. Marisa Silver’s second novel establishes her on the cusp of literary mastery. New Yorker contributor Silver (No Direction Home) writes a dark and devastating coming-of-age story. Even though most readers will not have lived the tough life that Ares has, they are sure to relate to his search for a place in the world. Highly recommended. Marisa Silver’s The God of War is a novel of great metaphorical depth and beauty. It stays with you like a lesson well and truly learned. The God of War also commits itself to a wary celebration of family love…always fierce and strong and, in its fallible way, true. ‘He had a voice, a pure, true voice that sang the world back to itself.’ Ares says of his brother. ‘It was the best thing a voice could be called upon to do.’ The same could be said of this lovely, necessary novel. The God of War is a sad but captivating book, and Silver subtly achieves exactly what she sets out to do. It ends with more questions than answers, and a soft resignation toward all that is ultimately unknowable, which is, perhaps, what the loss of innocence is all about. Silver writes lyrically of family crises exacerbated by mental debilities, exquisitely evoking a land of natural beauty and human menace and mindscapes both shaded and bright in an emotionally complex and unpredictable novel that insists on an all-at-once read. 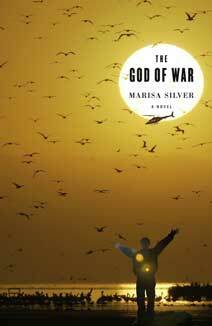 Marisa Silver’s The God of War is as gripping as it is beautifully written. By the end I ached for these brothers, Ares and Malcolm, as if they were my own family, and I will not forget them.